Fabi, was originally from Webster NY, and returned to the area after a long career in Washington DC ‘s Law Enforcement. She chose to begin her second chapter in a town close to her roots and family, selecting the Ontario location out of endearment and with her business in mind. 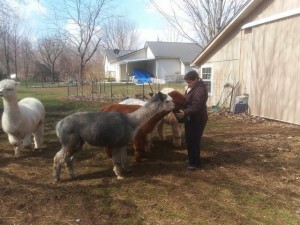 The Autumn Joy Alpaca Farm is located at 6018 Arbor Rd., Ontario, NY, and resides on a portion of the former Benedict Farm, which operated back in the 1950’s to 1970’s. It was during a visit to the Hemlock fiber festival, (part of the Genesee valley hand spinners guild), that Fabi first met an Alpaca, echoing, “It was love at first sight”. Intern her fondness and respect for animals endured. Fabi’s business is “a labor of love”, and she has created an eco-friendly environment, utilizing 100% of the herds resources and generating almost zero waste. Fabi mentions, “the only waste we have on the farm is the empty bags of grain, which can also be recycled and reused in many different ways”. Fabi researched becoming an Alpaca farmer for 3 years before taking the plunge, and has been in business for 5 years. Her crafting experience and skills, (“my grandmother taught me how to knit and crochet 55 years ago”), enable her to provide naturally unique products. “The Autumn Joy Alpaca herd is utilized strictly for its fiber, which is similar to sheep’s wool, because it is hollow, but softer and more luxurious like cashmere.” However, even the Alpacas’ manure “beans”, can be repurposed. Fabi creates “fire bricks” from the sun dried “beans”, which are mixed with melted wax and molded in tins to form a safe, renewable fire starter. She also manufactures another product from dried ground “beans” called, “Plant Tea”, which is sold in burlap bags. It is utilized to provide N, P, K macro plant nutrients, when rehydrated. The Alpaca industry is a large supporter of the artisans of Peru. 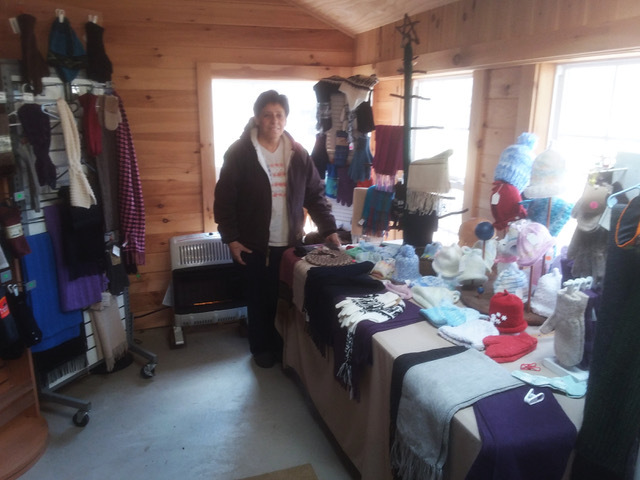 Fabi’s exceptional line of super warm, Artisan quality goods; socks, hats, gloves, sweaters and scarves are obtainable at Autumn Joy’s farm store (585-626-8967), local craft shows and on Facebook. “I knit and crochet about ½ of the products I sell, using my handspun yarn. The yarn is died on the stove, using all plant-based dies and white vinegar.” Another “Fabi-style” inventive offering includes, “drier balls.” Fabi makes the balls using an Alpaca fiber felting process. They last up to one year, and are designed to replace dryer sheets, helping to eliminate unwanted household chemicals. Customers may purchase an array of products ranging in price from $4.00 to $50.00. To generate new product ideas, Fabi attends actual fiber shows and she observes everyday items which can be remanufactured using alpaca fibers. Her beautifully designed purses are a prime illustration of her success. Roger Keymel, an alpaca farmer in Walworth, has been both a mentor and inspiration to Fabi during her business adventure. Keymel and his wife own 14 alpacas. Fabi comments, “Alpaca farmers in general are great people, shop local”. In the future, Fabi hopes to continue selling handmade alpaca products, while teaching children to respect and learn more about the Alpaca species. Interviewed by, Joellen Simone, Nature’s Way Florist, Ontario, NY.